The Web-GIS wildfire prevention and management platform AEGIS was developed aiming at reducing the potential human, environmental and property losses. The AEGIS platform assists with early fire warning, fire planning, fire control and coordination of firefighting forces by providing access to information that is essential for wildfire management. All functionalities are accessible for free to civil protection authorities, through an appropriate and modern graphical user interface. Palaeoseismological techniques applied with artificial trenches at three deep-seated gravity slope deformations (DSGSDs) in the Alps document extensional deformation and reverse slips. The data indicate that reverse slip might occur both at the toe and in the central-upper portions of DSGSDs. The reverse slip is interpreted as due either to locking of the frontal blocks of a DSGSD or to the relative decrease in the rate of downward movement in the frontal blocks with respect to the rear blocks. We present a chronological reconstruction of the 2011 eruption of Puyehue-Cordón Caulle volcano (Chile) which significantly affected the ecosystem and important economic sectors. The comparison with the impact associated with other recent eruptions located in similar areas shows that the regions downwind of the erupting volcanoes suffered similar problems, suggesting that a detailed collection of impact data can be largely beneficial for the development of emergency and risk-mitigation plans. 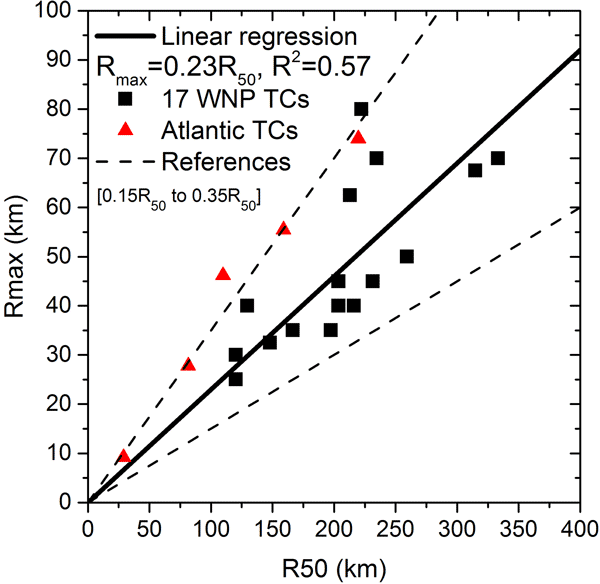 We proposed an Rmax estimation method based on the radius of the 50 knot wind (R50). The data obtained during the passage of strong typhoons by a meteorological station network in the Japanese archipelago enabled us to derive the following simple formula, Rmax = 0.23 R50. The proposed method is expected to increase the reliability of storm surge prediction and contribute to disaster risk management, particularly in the western North Pacific. The influence of meteorological conditions on rockfall occurrence has been often highlighted, but quantitative analyses are rare. A near-continuous survey of a limestone cliff has shown that the rockfall frequency can be multiplied by 7 during freeze-thaw episodes and 26 when the mean rainfall intensity (since the beginning of the rainfall episode) is higher than 5 mm h−1. Based on these results, a three-level scale has been proposed for predicting the temporal variations of rockfall frequency. Along the eastern coast of Malta, the processes responsible for the transport of anomalous large boulders from the sea to the coast were analysed. The wave heights required to transport them from the sea to the coast were estimated using a hydrodynamic approach, while AMS 14C ages were determined from encrusted marine organisms. The combination of the results suggests that the majority of boulders were detached and moved by storm waves, but the occurrence of past tsunamis cannot be ruled out. The paper describes a model framework for assessing flood risk in Jakarta under current and future scenarios (2030 and 2050) including climate change, sea level rise, land use change, and land subsidence. The results shows individual impact of future changes and serve as a basis to evaluate adaptation strategies in cities. They also show while the impacts of climate change alone on flood risk in Jakarta are highly uncertain, the combined impacts of all drivers reveal a strong increase in risk. We propose a new approach based on a simplification of the multi-layered elasticity theory in order to easily compute the additional stress due to a skier at the depth of the weak layer, taking into account the layering of the snow slab and the substratum. The method was tested on simplified snow profiles, then on manually observed snow profiles including a stability test and, finally, on simulated snow profiles, thereby showing the promise of our approach. In this study, we performed a model slope experiment with rainfall seepage, and the results were compared and verified using the unsaturated slope stability analysis method. The real-time monitoring system of porewater pressure or matric suction can be used as a warning of rainfall-induced slope failure. Based on the European Drought Impact report Inventory (EDII), the study presents an assessment of the occurrence and diversity of drought impacts across Europe. A unique research database has collected close to 5000 textual drought impact reports from 33 European countries. Consistently, reported impacts have been dominated in number by agriculture and water supply, but were very diverse across other sectors. Data and assessment may help drought policy planning at the international level. In recent decades there has been an increase in magnitude and occurrence of heat waves and a decrease of cold waves which are possibly related to the anthropogenic influence. This study describes the extreme temperature regime of heat waves and cold waves across South America over recent years (1980–2014). Results indicate an increase in intensity and in frequency of heat waves, especially in the last 10 years. Conversely, no significant changes are detected for cold waves. A method to identify mountainous watersheds with the highest flood risk at the regional level is proposed and applied in Bogotá (Colombia). Vulnerability at the regional level was assessed and combined with an existing flood susceptibility indicator, thus providing an index that allows the watersheds to be prioritised. Results show that vulnerability can be expressed in terms of four constituent indicators and a sensitivity analysis shows that the classification of vulnerability is robust. The Kamchatka volcano group is located near populated areas and international air routes. Due to this, explosive eruptions are a serious threat to their security. To decrease the risks, effective systems for remote detection of eruptions are necessary. WWLLN resolution is enough for the remote sensing of the volcano lightning activity in the early stage of ash cloud formation a few minutes after the eruption when electrification proceeds the most intensively. To investigate the present-day morphology of the 2006 Guinsaugon landslide scar and potential failure that may occur, analysis of a 5 m resolution IfSAR-derived DTM was conducted using Coltop3D and Matterocking software to produce a structurally controlled landslide hazard map for Southern Leyte, Philippines. This type of simulated hazard maps would be useful for disaster prevention and to facilitate disaster risk reduction efforts for landslide-susceptible areas in the country. The core contribution of this study is a new earthquake disaster loss estimation method for earthquake emergency response based on dasymetric exposure data, which consists of two phases: a pre-earthquake phase and a co-earthquake phase. This method can not only improve the speed and accuracy of earthquake disaster estimation for co-earthquake response, but it also provides the spatial distribution of possible deaths and building damage.